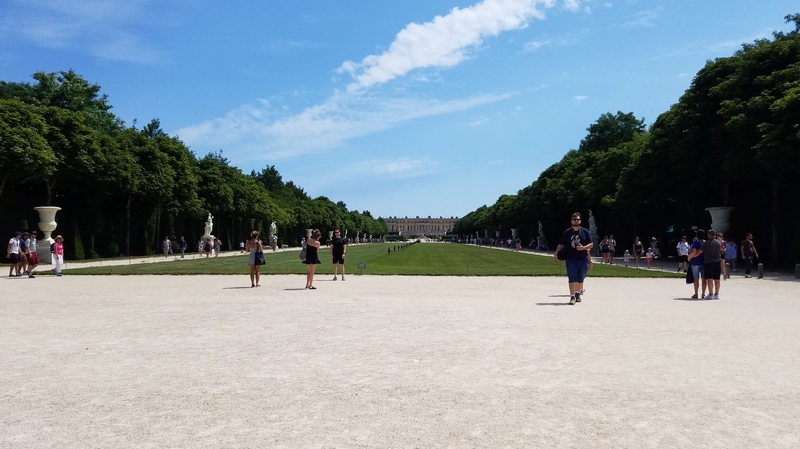 A few days ago we went to visit Versailles, which is a French palace initially built by King Louis XIII and expanded upon by Kings Louis XIV through XVI. The palace itself is a seriously impressive building; these guys knew what they were doing! However, as gorgeous and gilded and amazing as the palace was, the true gem of the estate is the gardens. In these are acre upon acre of green spaces, luxurious fountains and statuary, orchards, lawns, etc. And while there were as many people in the gardens as in the palace, some spaces were so remote that you could be alone in them. 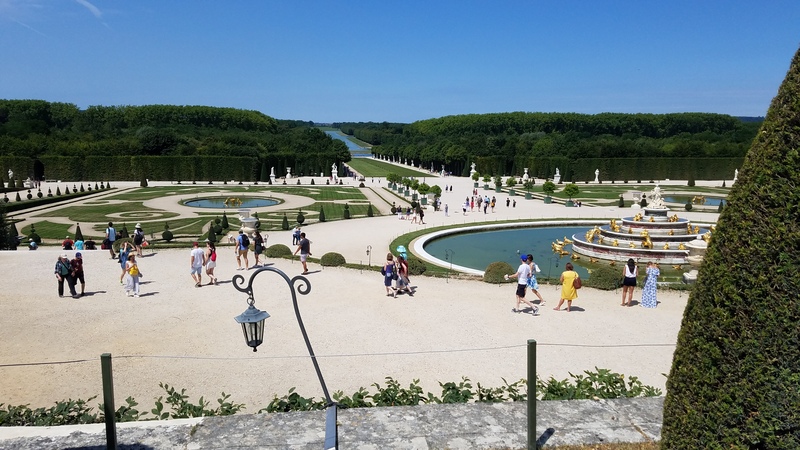 The true power of the gardens lies in its design; the way that the paths intersect, forming fun shapes and allowing sight across the entire vista. Several paths gave lines of sight from one major monument to the next (aka terminal vistas). These terminal vistas are symbols of several things: for one, they tell the visitor that there was immense forethought into the planning of this enormous garden. These sightlines don’t occur by accident! Second, the effect of these sightlines expands on the formality of the space. 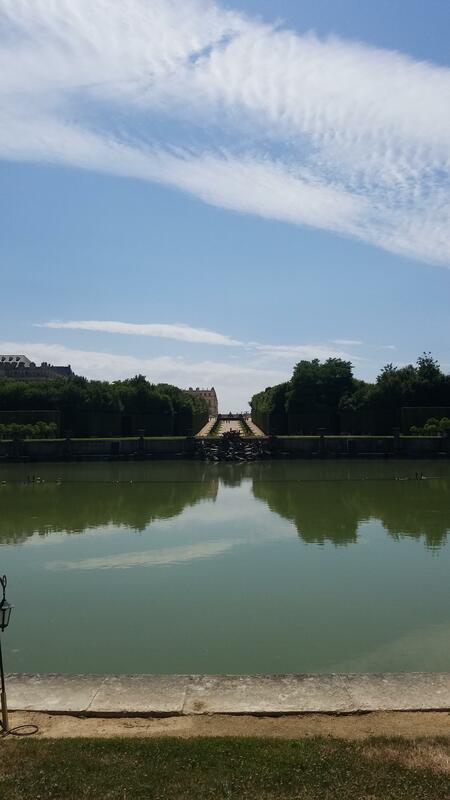 After all Versailles was, in the time of Louis XIV, a working mansion; it was where he hosted his courtiers and foreign dignitaries (when he wasn’t in Paris) and was essentially his seat of power. These main pathlines are perhaps not the place for a casual stroll. And to top it all off, several of the paths ended with the sight of the palace, or the Latona’s Fountain immediately in front of it. To me this gave the impression that no matter where I was in the garden, I could be pretty easily tracked by anybody who wanted to track me… and from only a few choice locations. All in all, I had a lovely time exploring the garden with my classmates; we had perfect weather, and it was wonderful to get out of the stuffy, packed palace into a more “natural” (albeit meticulously manicured) space! Day 2 of Paris: we explored a little of the Ile de la Cite, stepped into Saint-Chapelle de Paris, and took a lovely boat tour down the Sienne. The interesting thing about these adventures was the symbolism hiding in every inch meter of this city. I’ve been through a few cities in the USA: particularly Fredericksburg, VA and Washington, D.C., and never noticed the level of symbolism that I am seeing here in this city. So I’m asking myself why. From my lessons I know that D.C. is a city fair riddled with symbolism, and yet I’m ignorant of most of it. Is it because I take it for granted? Or am I more cognizant of the symbols in Paris because they’re being semi-aggressively pointed out to me at every corner? Maybe it’s a mish-mash. Nary a full day in Paris, and already we’ve lived a lifetime of adventure; from an uneventful flight to the mystery of French toilets, and then onwards to being lost in the rain trying to find our dorm. Never a dull moment!